Home > Politics > Is Trade War Good For Gold Prices? Is Trade War Good For Gold Prices? Gold prices have come under pressure quite a bit so far this year. However, as the week ended last week, the price of gold started to find its way upward. Ultimately, the gains in the price of the commodity have to do with a move that was made by United States President, Donald Trump, to give United States steel and aluminum companies a competitive advantage. Unfortunately, many believe that this will lead to a trade war. While that may not be a good thing for the market or the United States economy, it could prove to be great for gold. Today, we’ll talk about the announcement made by President Trump, why this led to gains in gold, and whether or not a trade war would be a good thing for the precious metal. As mentioned above, we saw gains in the gold price as the week came to a close last week, reversing from the recent declines that we’ve seen on the precious metal. So, what’s the deal? Well, it has to do with President Donald Trump. On Thursday, President Trump and the White House Administration announced that Tariffs would be placed on steel and aluminum that crosses the United States borders. According to various reports, these tariffs will be charged at a rate of 25% for steel and 10% for aluminum. Why Is This Leading To Gains In Gold? As investors, we know that gold is a safe haven investment. This is ultimately the reason that President Trump’s announcement led to such gains in the price of gold. At the end of the day, basic materials like steel and aluminum are overwhelmingly important to economies around the world, and the United States just so happens to be one of the world’s largest consumers of these materials. The reality is that when tariffs are charged on these materials, sales surrounding the materials will likely decline. This will lead to some serious economic hardship. While the declines will upset the balance in China and other regions, Canada is likely to be the hardest hit as this news comes at a very bad time for the Canadian economy. Because gold is considered to be a safe haven investment, the value of the commodity tends to climb when there is a present threat to specific developed economies or the global economy as a whole. With the tariffs in mind, President Trump’s are already leading to economic concerns and could lead to a global trade war. 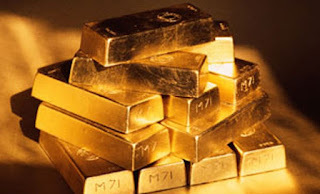 If this happens, the global economic impact could be massive, which would lead to further strength in gold. So, investors seem to be preparing for this type of scenario. Considering how quickly this story is evolving, we’re likely to see more updates regularly. Each one of these updates has the potential to lead to movement in the price of gold. So, be sure to follow the story very closely!